So now you guys know what I was doing all winter. I was co-editing the new, more massive-than-ever Baseball Prospectus 2013 annual. The tome this year is 592 pages and contains capsule descriptions and stat projections for over 2,200 players, more than ever before. Two thousand names is a lot to work with as an editor, but keeping the data on these players, and getting their names right, is a huge part of the editing process. Of course, some guys recently changed names, like the Player Formerly Known as Fausto Carmona, and Giancarlo Stanton… but we manage. In the long dark winter months, as we toil in the serial comma mines, some names jump out like an opal in the coal. Names like Kevin Quackenbush, Beamer Weems, and Max Fried. As I mentioned in this interview with me at Bugs & Cranks about BP, let me tell you, at three in the morning, when your co-editor IMs you to say “Did you realize there are TWO players named Guillermo Pimentel?”–you feel Max(imally) Fried. I think the most oxymoronic name, of the 2,210 in the book, is that of Sonny Gray. Are they selling the naming rights to players now, as well as stadia? Viz: Ehire Adrianza. As an editor, the names that catch my attention the most, though, are the ones I’m absolutely certain are misspelled the first time I see them. There are a lot of them. Runners up who almost made the list: Jesmuel Valentin, Dismasther Delgado, Adeiny Hechavarria, Tyler Knigge, and Kirk Nieuwenhuis. Then there are the names that seem like they ought to be baseball-predictive… or the opposite. You know, like how Joe Panik had better stay calm out there, and it’s true, Mark Buehrle is 230 pounds, 6-foot-3. Brad Hand is a pitcher, but why is Charles Brewer in the Diamondbacks system? There’s a pitcher named Josh Outman, but right now he catches too much of the plate to live up to that moniker. And Neil Walker is a hitter, but he strikes out twice as often as he walks. Hey, we can even have multi-lingual puns here, with pitchers like Arquimedes Caminero–which means walker, but as a pitcher his walk rate has actually dropped every season so far. DAN STRAILY — You’d think he’d have control problems with a name like that, but if anything, Straily catches too much plate, if his home-run rate is any indicator. SEAN DOOLITTLE — He’s actually done a lot, transitioning from first base to pitching to debut in MLB last year with the A’s. GRANT BALFOUR — Well, he walks 3-4 men per nine innings, anyway. AARON LOUP — He really needs to develop a curveball, no? R.A. DICKEY — He’s actually a really nice guy. ROBERT FISH — He’ll have to induce more strikeouts to live up to that name. NAVERY MOORE — Only if he played for the Ravens. MIKE MINOR — He put in 30 starts in the big leagues last year, though. SCOOTER GENNETT — Oh wait, his real first name is Ryan. Doesn’t count. MIKE FIERS — Actually, his fastball tops out in the 80s. MICHAEL WACHA — Is that pronounced Walker? CHRISTIAN YELICH — Clearly destined to be a third-base coach or an evangelist, perhaps. ZACK WHEELER — He’s a pitcher with advanced mechanics, but can he steal a base, too? JOSH SMOKER — But he actually has a whole selection of pitches, not just a fastball. JOSH SATIN — Is he smooth at three infield positions? KEVIN SLOWEY — Ironic: his problem is he works too quickly from the stretch and loses his command. CHANCE RUFFIN –Left-handed hitters mug him in a dark alley? DREW STUBBS — Insert lottery joke here. Of course I’m not putting the positions in here because that would be giving away all my secrets. Also, you’re supposed to look it up in the book, or at least at the Baseball Prospectus web site. 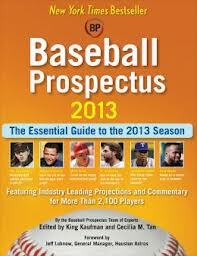 Baseball Prospectus 2013 is on sale now as book, ebook, and app. (Actually, last I looked Apple was dragging their feet and the iTunes app wasn’t live yet, but it should be any day now, and this year there is an Android version, too.) Last year I really enjoyed having the app on my phone during Spring Training because there wasn’t a call-up I saw in any of the games I went to that I couldn’t instantly get a scouting report on, which made me the hero of my entire section at Steinbrenner Field. This was written by Cecilia Tan. Posted on Tuesday, March 5, 2013, at 10:00 am. Filed under Baseball Musings, Book Reviews. Tagged baseball books, baseball prospectus. Bookmark the permalink. Follow comments here with the RSS feed. Post a comment or leave a trackback.